The larynx has multiple functions, including the voice production, cough, and airway protection, and it also acts as a conduit for breathing. Pathologic conditions that affect normal laryngeal function can result in poor cough production, aspiration with subsequent pneumonia, change in phonation, and dysphagia. Chondronecrosis of the larynx is a rare complication encountered in otolaryngology. Chondronecrosis of the larynx. Contributing factors leading to chondronecrosis. Incidence may have increased more recently with the increased use of chemotherapy and radiation. When present, chondronecrosis can have severe sequelae. Causes include radiation therapy, relapsing polychondritis, long- and short-term intubation, infection, trauma, tracheotomy, and neoplasms. Radiation is the most common cause of chondronecrosis. Many patients with head and neck cancer receive radiation therapy, which attempts to preserve the larynx and its aerodigestive function. Radiation therapy has expected mild adverse effects, but the development of chondronecrosis can be devastating, with significant morbidity and even mortality. Once developed, laryngeal chondronecrosis generally is irreversible. Laryngectomy is often required because of life-threatening laryngeal instability. Any etiology resulting in chondronecrosis of the larynx may cause instability and subsequent airway limitation and possible obstruction. Recognition of perichondritis may prevent progression to chondritis and necrosis. Careful evaluation, early detection, and timely intervention therefore are essential for laryngeal preservation. In a 1982 pathologic study by Keene in which laryngeal specimens prepared by whole organ serial sectioning were reviewed, the incidence of histologic chondronecrosis and osteomyelitis could be correlated with tumor stage. In early stage (pT1-pT2) tumors, the incidence was 2% (1/41), while in advanced staged tumors (pT3-pT4) treated with 4500-6000 rads, the incidence of chondronecrosis was 27% (39/143). The overall incidence in the study was 26%. This was higher than that observed clinically, however. In 1994, Parsons reported that 1-5% of patients receiving radiation therapy to the larynx develop chondronecrosis,  while a 2017 study by Melo et al found chondronecrosis in three out of 28 patients (10.7%) treated with chemoradiotherapy for laryngeal cancer. Because chondronecrosis may develop at any time, shortly following treatment or even decades later, the true incidence may be underestimated. Other causes of chondronecrosis occur with less frequency. Relapsing polychondritis has been reported to cause laryngotracheal instability in 13-38% of patients. Chondronecrosis rarely develops secondary to primary infection or trauma. Radiation therapy for squamous cell carcinoma of the larynx has become increasingly safe and effective over the last 50 years. The incidence of severe reactions following 5000-6000 rads has decreased from 5-12% in 1970 to approximately 1% in the 1990s. Complications from radiotherapy (RT) typically occur following a latent period of approximately 6 months. The most common complication, persistent laryngeal edema, occurs in 13.7% of patients who receive a dose less than 7000 centigrays (cGy) but rises to 46.2% with doses of 7000 cGy and above. 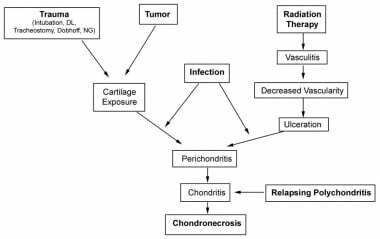 In a 1977 study by Kashima and Holliday, an association existed between chondronecrosis and 3 specific factors: (1) radiation dose/time relations, (2) presence of infection, and (3) general vascular condition of the patient. Chondronecrosis occurs in the patient who receives high-dose radiation combined with disruption of the mucoperichondrium, either by tumor invasion or by trauma. Vascular disease, which can be compromised further by smoking and by the presence of infection, contributes to the likelihood of chondronecrosis. A recent case of chondronecrosis with ulceration of the anterior neck and subsequent tracheal fistula was reported 44 years after irradiation, however. Another case of delayed complications occurred in a patient who, 22 years prior to a laser chordotomy, had radiation therapy to the neck. Following the Nd:YAG chordotomy she developed necrosis of the epiglottis with severe respiratory distress. Chandler proposed a grading system for laryngeal radionecrosis (see the Table). Grades I and II are common postradiation changes and typically respond favorably to conservative treatment (ie, humidification, voice restraint, discontinuation of smoking, antibiotics). Grade III and IV reactions are more severe, have less favorable outcomes, and are considered complications of radiotherapy. Relapsing polychondritis is an autoimmune disorder of the cartilage, central nervous system, eye, blood vessels, and labyrinth. First described by Jaksch-Wartenhorst in 1923 as polychondropathia, the author described a patient with pain, swelling, and deformity of the ears and nose, as well as stenosis of the external auditory canals. It is frequently associated with rheumatoid arthritis, systemic vasculitis, connective tissue diseases, and/or hematologic disorders. Although the pathogenesis remains unknown, serum antibodies against collagen types II, IX, and XI, as well as cellular immunization against cartilage tissue and binding of both immunoglobulin and complement proteins in affected cartilage have been demonstrated. Further support was obtained in animal models where immunization against type II collagen and noncollagenous cartilage components produced symptoms of polychondritis. In a study of 435 patients with relapsing polychondritis, laryngotracheal instability was noted in 13-38% of patients. Other symptoms at the time of diagnosis included auricular chondritis (26-91%), arthritis (23-47%), nasal chondritis (16-33%), ocular disorders (14-24%), and hearing loss (6-9%). Approximately 30% of patients developed associated systemic diseases, including polyarthritis, systemic lupus erythematosus, Behçet syndrome, and other vasculitides and connective tissue disorders. In 1979, Damiani and Levine presented 10 patients with polychondritis, 4 of whom experienced laryngeal chondritis or laryngeal tracheal collapse. Symptoms include hoarseness, dyspnea, stridor, aphonia, choking sensation, and tenderness over the thyroid cartilage. Respiratory distress as an initial symptom is reported in 18% of cases, and eventual respiratory tract complications, including tracheobronchial involvement, is reported in up to 50% of patients. Chondronecrosis of the cricoid cartilage has been described after short-term intubation in an 8-month-old patient and a 4-year-old patient. Both patients had been intubated only 2 days. One developed symptoms 10 days following extubation, ultimately requiring a tracheostomy for survival, while the second patient developed symptoms immediately upon extubation. Medical management with intravenous (IV) antibiotics and steroids was successful in the treatment of the second patient. Contributing factors in these 2 particular cases included pressure by the endotracheal tube on the cricoid cartilage and trauma during emergent intubation. Other authors have described cricoid chondronecrosis in infants and children in the literature. Using intubation with a gentle technique, using an appropriate size tube, and securing the endotracheal tube can prevent intubation injury. Good hygiene and nursing care may also help prevent trauma to the subglottic airway. Antibiotics can be used prophylactically, and regular check-ups allow earlier identification of potential complications. Selecting the proper size endotracheal tube eliminates excessive pressure and the potential for pressure necrosis and vascular compromise. Estimations can be made using formulas ([age (year) + 16]/4) or simply the width of the fifth fingernail. The use of steroids has been suggested but remains controversial. As mentioned above, radiotherapy induces a hypoxic environment by stimulating reactive fibrosis and endarteritis of blood vessels, as well as obliteration and fibrosis of lymphatics. Edema develops secondary to increased permeability and decreased lymphatic drainage, which leads to further compromise of the nutrient supply. With perichondrial membrane breakdown, ischemic cartilage is exposed to aerodigestive tract bacteria. If not identified and treated early, infection ensues, ultimately leading to frank chondronecrosis. In relapsing polychondritis, the pathophysiology is incompletely understood. However, serum antibodies against collagen, as well as cellular immunization against cartilage tissue, have been demonstrated. Activation of the immune response therefore can lead to chondritis and chondronecrosis. Once the perichondrium becomes violated, regardless of the etiology, organisms have access and can initiate a localized infection with progression to chondritis and/or chondronecrosis. Vascular compromise is a result of the infection and promotes the destruction of cartilage. Factors that can interrupt the perichondrium include neoplasms, trauma, and iatrogenic causes. The image below depicts how these and other factors contribute to the development of laryngeal chondronecrosis. The cartilaginous framework in a patient with laryngeal chondronecrosis becomes unstable. This alters the airway size, mobility, and structure. Patients may present clinically with any of the following: dysphagia, odynophagia, hoarseness, stridor, dyspnea, respiratory obstruction, and recurrent aspiration. Following radiotherapy, most patients become symptomatic within the first year. However, case reports exist of patients presenting 25 and even 50 years following radiotherapy because fibrosis and endarteritis continue with time. The typical patient with radiation-induced chondronecrosis initially develops symptoms of hoarseness and breathiness. The cricoarytenoid joint can become affected, and the arytenoids may become partially fixed without complete rotation or medial sliding motion along the cricoid. Because of this limited mobility, the ability to fully abduct or adduct the vocal folds may be impaired. Without full abduction, mild stridor or exercise intolerance may occur and become progressive. If airway distress develops, an emergent tracheotomy may be needed. Incomplete vocal fold closure causes breathiness and the potential for aspiration. The usual course is to have greater difficulty with liquids than with solids, but progressive dysphagia may occur. The accessory laryngeal muscle activity may become impaired because of fibrosis, and thus, the normal laryngeal elevation needed for swallowing fails, leading to an unprotected airway. If an individual has recurring aspiration secondary to poor swallowing function, pneumonia and respiratory compromise can occur. Recurrent pneumonia is an indication that a definitive treatment such as laryngectomy may be indicated. Odynophagia and neck pain and stiffness are other late symptoms of chondronecrosis. No contraindications exist for the treatment of chondronecrosis of the larynx. Keene M, Harwood AR, Bryce DP, van Nostrand AW. Histopathological study of radionecrosis in laryngeal carcinoma. Laryngoscope. 1982 Feb. 92(2):173-80. [Medline]. Parsons F. The effect of radiation on normal tissues in the management of head and neck cancer. In: Management of head and neck cancer: A multidisciplinary approach. Philadelphia, Pa:. Lippincott-Raven. 1994:183-184. Melo GM, Souza PD, Bastos LC Filho, et al. Laryngeal chondroradionecrosis following radiotherapy. Rev Col Bras Cir. 2017 Jul-Aug. 44 (4):374-82. [Medline]. [Full Text]. Hernando M, Hernando A, Calzas J. [Laryngeal chondronecrosis following radiotherapy and concurrent chemotherapy]. Acta Otorrinolaringol Esp. 2008 Dec. 59(10):509. [Medline]. Alexander FW. Micropathology of Radiation Reaction in the Larynx. Ann Otol Rhinol Laryngol. 1963 Sep. 72:831-41. [Medline]. Kashima HK, Holliday MJ, Hyams VJ. Laryngeal chondronecrosis: clinical variations and comments on recognition and management. Trans Am Acad Ophthalmol Otolaryngol. 1977 Sep-Oct. 84(5):ORL878-81. [Medline]. Janssens GO, Rademakers SE, Terhaard CH, et al. Accelerated radiotherapy with carbogen and nicotinamide for laryngeal cancer: results of a phase III randomized trial. J Clin Oncol. 2012 May 20. 30(15):1777-83. [Medline]. Beswick DM, Collins J, Nekhendzy V, Damrose EJ. Chondronecrosis of the larynx following use of the laryngeal mask airway. Laryngoscope. 2015 Apr. 125 (4):946-9. [Medline]. Jaksch-Wartenhorst R. Polychondropathia. Wien Arch Intern Med. 1923. 6:93-100. Damiani JM, Levine HL. Relapsing polychondritis--report of ten cases. Laryngoscope. 1979 Jun. 89(6 Pt 1):929-46. [Medline]. Beg MH, Marfani S. The larynx in pulmonary tuberculosis. J Laryngol Otol. 1985 Feb. 99(2):201-3. [Medline]. Briggs RJ, Gallimore AP, Phelps PD, Howard DJ. Laryngeal imaging by computerized tomography and magnetic resonance following radiation therapy: a need for caution. J Laryngol Otol. 1993 Jun. 107(6):565-8. [Medline]. McGuirt WF, Greven KM, Keyes JW, et al. Positron emission tomography in the evaluation of laryngeal carcinoma. Ann Otol Rhinol Laryngol. 1995 Apr. 104(4 Pt 1):274-8. [Medline]. McGuirt WF. Laryngeal radionecrosis versus recurrent cancer. Otolaryngol Clin North Am. 1997 Apr. 30(2):243-50. [Medline]. Theissing G. [Laryngeal reconstruction after subtotal loss of cartilage due to radiation perichondritis]. Z Laryngol Rhinol Otol. 1973 Jan. 52(1):54-8. [Medline]. Draf W. [Problems of laryngeal reconstruction following perichondritis of the larynx (author''s transl)]. HNO. 1980 Jul. 28(7):218-21. [Medline]. Balm AJ, Hilgers FJ, Baris G, Keus RB. Pectoralis major muscle transposition: an adjunct to laryngeal preservation in severe chondroradionecrosis. J Laryngol Otol. 1993 Aug. 107(8):748-51. [Medline]. Eliachar I, Marcovich A, Shai YH. Rotary-door flap in laryngotracheal reconstruction. Arch Otolaryngol. 1984 Sep. 110(9):585-90. [Medline]. Spraggs PD, Tostevin PM, Howard DJ. Management of laryngotracheobronchial sequelae and complications of relapsing polychondritis. Laryngoscope. 1997 Jul. 107(7):936-41. [Medline]. Michet CJ Jr, McKenna CH, Luthra HS. Relapsing polychondritis. Survival and predictive role of early disease manifestations. Ann Intern Med. 1986 Jan. 104(1):74-8. [Medline]. Demizu Y, Fujii O, Nagano F, et al. Unexpected radiation laryngeal necrosis after carbon ion therapy using conventional dose fractionation for laryngeal cancer. Jpn J Clin Oncol. 2015 Nov. 45 (11):1076-81. [Medline]. Chondronecrosis of the larynx. Modified barium swallow using thin contrast; the study demonstrates significant aspiration. Chondronecrosis of the larynx. Modified barium swallow using thick contrast showing persistent aspiration. Chondronecrosis of the larynx. Videostroboscopy showing decreased vocal cord mobility on the left with paralysis on the right. Chondronecrosis of the larynx. Nasopharyngoscopy showing decreased vocal cord mobility on the left with paralysis on the right as the patient attempts to perform a high-pitched E.